From all of us at FOCUS, we wish you and your family a very happy holiday season filled with love and laughter! New sites to serve you! Remember to like our Facebook page for more information on our new site staff and upcoming events for parents and children. Visit our website for a full listing of FOCUS Sites. Creating a family scrapbook is a great way to reflect on the special events of the past year and see how your family has grown and changed. Check out these tips from FOCUS for creating your own family scrapbook over this year’s winter break! Setting realistic and acheivable goals is key to building on your family's current strengths and supporting future resilience in the face of challenges. 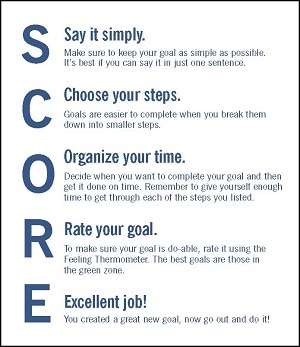 The SCORE technique is a great way to make sure the goals you set for yourself are achievable. It can also be a great tool for introducing kids to the idea of setting goals and planning out how to accomplish them. Use the steps below to set your next goal!